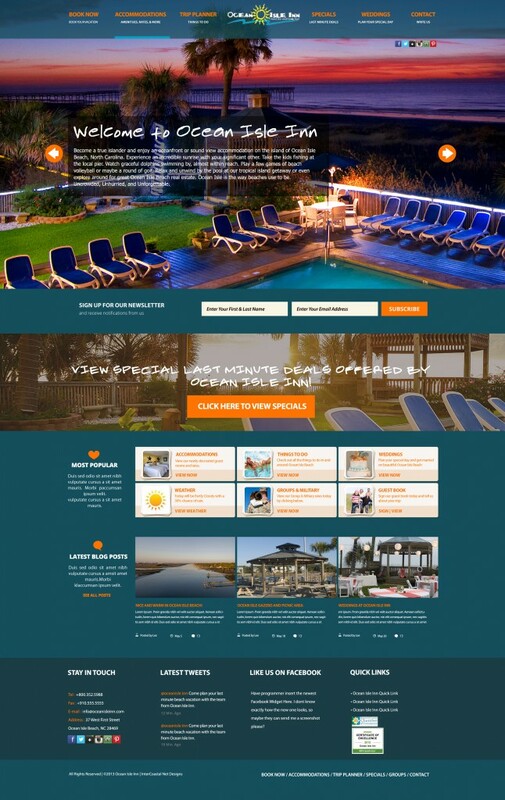 Ocean Isle Inn Launches New Website! ICND is proud to present a newly designed, responsive website, for our long time client the Ocean Isle Inn. We have been working with the team from the Ocean Isle Inn for many years, and this is the third redesign they have gone through with ICND. The newest site showcases large photos of the hotel grounds and has been built to be mobile friendly responsive. Ocean Isle Inn is also a long time marketing client of ICND’s, participating in SEO, PPC, Email Marketing and Social Media Marketing. Located in Ocean Isle Beach, North Carolina, the Ocean Isle Inn was one of the first structures built on Ocean Isle Beach back in the 1950’s. Starting as just a 6 bedroom Inn, this gorgeous hotel has come a long way! If you’re looking for a great place to stay on the Ocean Front in Ocean Isle, look no further!